As the 20th century came to a close, the Caribbean Community continued to be confronted with major challenges and urgent tasks. The changes in the international political and economic system became pronounced after the collapse of the Soviet system in 1989. The world was then configured as unipolar and characterised by a new phase of globalisation. This new phase of globalisation expressed itself in many ways. Of particular importance to the Caribbean Community was the fact that changes in the scope and speed of the financial world and the phenomenal expansion of trade were occurring at unprecedented rates. The Community seemed in danger of potential marginalisation. 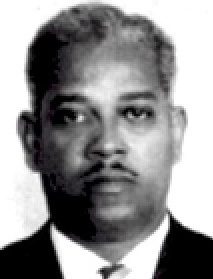 In fact, the then Prime Minister of Trinidad and Tobago, Mr. A. N. R. Robinson warned of the Caribbean becoming "backwater" of global events. The Caribbean Community was therefore constrained to examine the relevance of its institutions and the particular structures and strategies which were necessary for adjustment and survival. In 1989, therefore, at the 10th Conference of Heads of Government of the Caribbean Community in Grand Anse, Grenada, the leaders of the Caribbean Community recognised that not only was the Community in need of institutional and structural reform but also decisions had to be made to bring it in line with global economic and political developments. More particularly, the West Indian Commission was appointed to look into the ways in which the Community could be strengthened and reformed to accommodate the rapid and fundamental changes which were occurring at the time. At the Regional level, important developments were also occurring. The Region was celebrating the Centennial of Columbus' Arrival. And these celebrations helped to dramatise the need for the Community to project its unique cultural values and channel the consciousness of the people into areas and programmes which could lift the profile of the Community and its peoples. 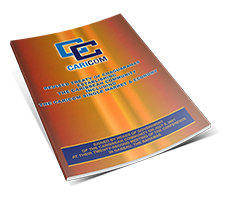 Dr. Carrington's tenure therefore coincided with major global and Regional developments. The West Indian Commission which were to recommend major institutional and structural changes, that would ensure that the Community could participate in a dynamic globalised economy. This was not all. At the century's end, the scourge of AIDS and the problem of terrorism have raised their dreaded heads. 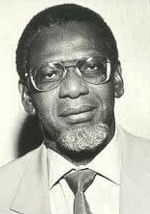 Dr. Carrington brought to the position of Secretary-General: firstly, he had had a long association with a number of intellectuals who had studied West Indian economic development and Caribbean integration; secondly, he had acquired valuable experience as the Secretary-General of the African, Caribbean and Pacific (ACP) Secretariat, where he had responsibility for managing that tri-Regional body, and mobilising resources for it; thirdly, he had previously served as a technician in the CARICOM Secretariat; and fourthly, he had studied the experience of Europe seeking to intensify and deepen its own integration. 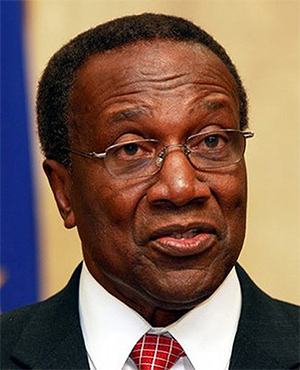 As the tenure of Dr. Carrington began, a number of important institutions were recommended by the West Indian Commission in its Report and subsequently ratified by some of the Heads of Government: the Caribbean Court of Justice (CCJ), the Assembly of Caribbean Community Parliamentarians (ACCP), the Association of Caribbean States (ACS), the CARICOM Single Market and Economy (CSME) and the Charter of Civil Society. The most important of these new institutions are the CSME and the CCJ. The latter was integral to the successful functioning of the CSME. These institutions were not only intended to facilitate greater participation of the people of the Region in the Integration process but also to enable it to cope with the requirements of a global economy and major Regional economic developments. During his tenure he has been successful at bringing those instruments on stream, even though he has expressed dissatisfaction at the pace of implementation. The leaders of the Community had been constrained to identify implementation as its "Achilles heel". The question therefore was how quickly and effectively the identified new structures of the Community could be made to come on stream. It would be Dr. Carrington's responsibility, among other things, to ensure that these institutions became functional. He would apply himself to this task. 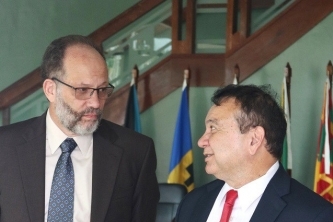 The completion of the CSME is not only important in economic terms but it needs to be "up and running ..." (to) "give us a platform from which to negotiate a lot of the elements of the Free Trade of the Americas. "38 The question of a structure to propel the Community forward at this stage of its development recurs as a theme and a source of concern to several of the Secretaries-General interviewed or who have so expressed themselves in the public domain. It may also be appropriate to point out that at this time of writing, the Community is once again revisiting the proposal of the West Indian Commission to oversee the implementation of decisions taken by the Heads of Governments. 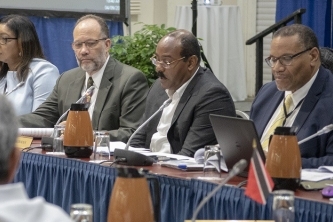 Reports suggest that this will be the subject of concentrated discussion and consideration at the forthcoming 24th Conference of the Heads of Government of the Caribbean Community. 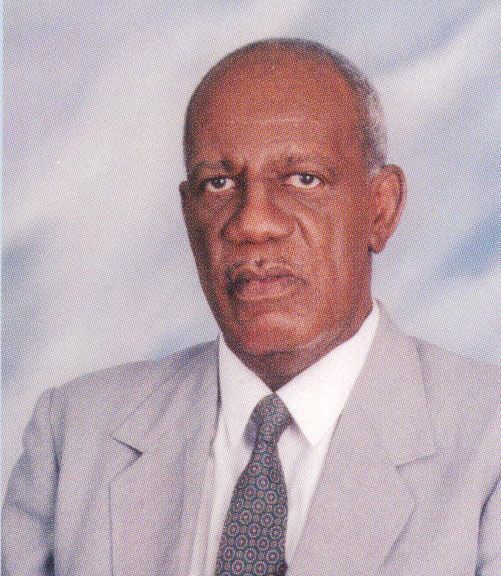 But Dr. Carrington, in common with other Secretaries-General, felt that whatever institutions are created, or whatever sweeping economic changes were to be made, the fact remains that the Caribbean Community could only make effective and substantive progress if it was centred on the people of the Region. Indeed, in his address to the 14th Meeting of the Heads of Government of the Caribbean Community held in Nassau, The Bahamas in 1993, he put the matter squarely: "A community, no matter how well structured, however, will not be able to respond adequately to the aspirations of its peoples - certainly not the West Indian people - if it does not cater for their active and fulsome involvement." 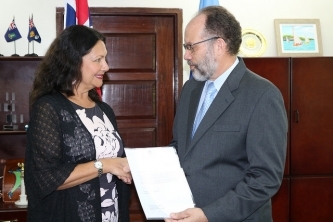 The implementation of the Charter of Civil Society and the Assembly of Caribbean Community Parliamentarians (ACCP) were issues, which Dr. Carrington sought to implement as soon as possible. A people-centred Community is such an essential factor in the building of an integration process relevant to the demands and requirements of the 21st century that most observers believe that the Caribbean leaders must act with despatch and urgency to ensure mechanisms are in place to accommodate the knowledge and wisdom of the Caribbean people. 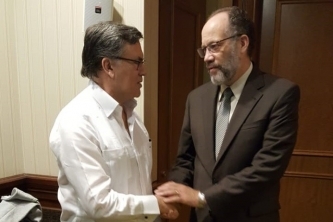 The Caribbean people will have to play the necessary role in addressing the economic problems already identified and assisting in the process of building and strengthening the new structures identified by the leaders of the Community. Modern economic developments is characterised by market forces. The Private Sector therefore has a special and particular role to play. One of the challenges that Secretary-General Carrington sees in the future for the Caribbean Community is to get greater commitment and support from the Private Sector of the Region. He does not believe that the Private Sector takes full advantage of the opportunities offered by the integration process. Dr. Carrington is also an advocate of the potential of cross-border investment to the wider Caribbean Basin in the context of the widening of the Community. 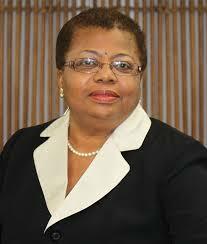 In this regard, it must be stated that the widening of the Community has been marked during Dr. Carrington's tenure. Apart from the Association of Caribbean States (ACS), the Community has strong political and economic lines with Central America. Also, the Community's relationship with the USA is now conducted in a mutually accepted framework. 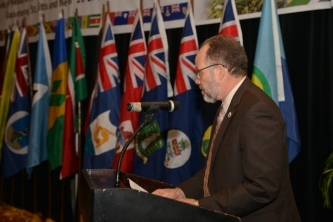 There was emphasis too on the necessity for the Regional press to be bolder in promoting the ideas behind the integration movement and ensuring that the Caribbean people understand the dynamics of modern economic developments, the difficulties faced by the Community and the new structural and other changes which have occurred and are occurring. Resources invested in public relations and other media related activities have not yielded the expected returns. This was unfortunate, as it was absolutely necessary to get information to the people about the integration process so that they could understand precisely what is being done to better their lives. Two other factors of importance to Dr. Carrington need to be mentioned. He is a proponent of the view that women should be allowed to realise their full potential and be involved in the developmental process. It is no accident therefore that the first female Deputy Secretary-General, Dr. Carla Barnett, should have been appointed during his tenure. Cricket too has won his attention. Cricket as an institution has been given emphasis during his administration. Dr. Carrington has given a relatively full account of the difficulties which confront the Secretary-General in the execution of his duties.40 He has to take account of the sensitive national points of view of fifteen Member States in making any decision or seeking an adjustment to any such decision. The Secretary-General is also under constant pressure as he is confronted by a myriad of problems relative to the work and activities of the Secretariat and developments within the Member States of the Community. 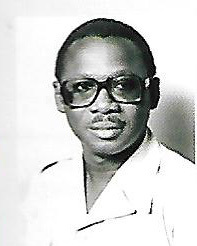 But Dr. Carrington has adverted to the fact that he has been able to rely on the trusted and capable corps of officers within the Secretariat. His style of management is participative. Dr. Carrington is also an individual, like most of his predecessors, of broad interests. Reference has already been made to his interest in cricket. He is also passionately interested in the music and culture of the Region. Dr. Carrington finds stimulation and purpose in the musical and cultural expressions of the Region. A deep humanitarian concern has pervaded his reflections on the effects of scourge of AIDS on the societies of the Caribbean Community, particularly its young people. The final thing to be said is that Dr. Carrington is fully aware that this would be a period of implementation in order to make the Community dynamic, functional and effective.